When a Fitch Designer meets with you to plan your room addition or remodel, a key decision is creating the best way to bring sunlight and the night sky into your home.The effect that natural light has on us physically, emotionally and psychologically is well known and the benefits of how it positively impacts our environment. At Fitch Construction, we offer solutions to create a healthy home environment, as well as providing energy savings. As Western New York's authorized dealer and installer of VELUX Skylights, Sun Tunnels, and Roof Windows, in addition to Andersen Windows & Doors, we create more than just a beautiful look to your home. When it comes to skylights, sun tunnels, and roof windows, Fitch Construction sells only VELUX products. They are simply the best within today's skylight market. VELUX knows when selecting a new or replacement product, the perfect blend of functionality, light, and lifestyle has to be considered. Please take a quick look at this VELUX video to learn why the ceiling is your home's "fifth wall." VELUX offers a complete system of complimentary products and accessories for any solution from installation down to the finishing touches. Our design consultants will assist you in selecting from several categories to find the right residential skylight, sun tunnel or roof window for you. 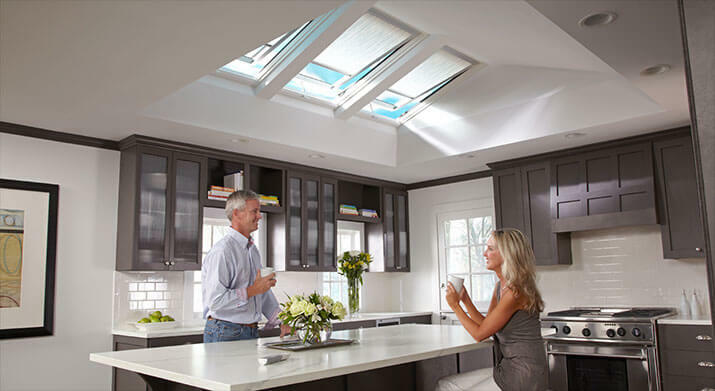 Consider replacing older skylights to improve the energy efficiency of your home. VELUX improves the energy performance of their skylights with each new model, so even if you have an older skylight, it is often worth upgrading with a newer model. Current skylight models come standard with dual paned coated glass, which improves the energy performance rating of 35% over skylights from the early 1990s constructed with dual pane clear glass. If you have acrylic bubble skylights in your home, the energy performance gain is even greater. VELUX Solar Powered "Fresh Air" Skylights qualify for a 30% federal tax credit on purchase and installation of solar electric property through Dec. 31, 2019. Fitch Construction believes in using the right materials for your home on all projects. Due to this belief, we offer great choices in the areas of Window and doors. With our partner Andersen Windows & Doors, Fitch Construction selects Andersen windows and patio doors since they are beautiful, energy-efficient, and enhance the look of your home inside and out. Fitch Construction has worked with Andersen products for decades and will help you choose just the right windows to fit your needs and budget. As a factory-trained Andersen installer, Fitch knows how to do the job right the first time, every time. Andersen offers a wide range of window styles to fit the need of the room as well as match the architecture of the house. Andersen's 20-year limited warranty on glass and a 10-year limited warranty on non-glass parts, you are assured of their quality and reliability. This limited warranty is non-prorated and fully transferable, so it stays intact even if the home changes ownership. With our newest partner Sunrise Windows & Doors, their windows are designed to perform. They've carefully selected the best materials to make their windows stand above the competition in both aesthetics and the comfort and efficiency they bring to your home. Many factors contribute to their windows being energy efficient, including installation, low-e technology, and construction. We have the numbers to back our products. You can see their performance ratings and details regarding installation and options and how they affect performance. Would you like to contact Fitch to set up an appointment?"